For those of you who are old enough to remember the 60' &70's, a commonplace sight was to see folks rolling cigarettes (of all kinds) using a bamboo rolling mat. Now we get a few dozen e-mails each month from just such people who have been looking for bamboo rolling mats. Until recently we have not seen them and conveyed the information to our readers that they no longer exist, at least on a commercially viable scale. In fact they never were mass produced, major brand items. They usually could be found at fairs, festivals or swap meets and were generally hand-made by the person you bought them from or were obtained as generic imports and then individually labeled. Most were from 12" to 16" square and many folks who liked them substituted bamboo place mats found at import shops like Pier One or Cost Plus. These worked nearly as well, though in most cases, they were pretty big. There was only one actual "brand" I remember from those days with the name stamped on it but for the life of me I cannot remember that name and I believe it was still a regional (California) item (It might have been Bambu though). Well, for those of you who have asked, there is now a mass-produced, readily available rolling mat. 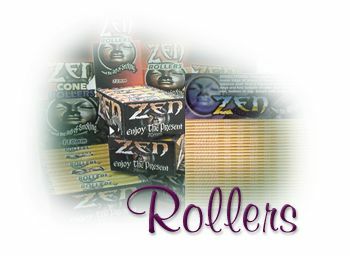 HBI (Herbal Bar Industries, www.hbiinternational.com ) of Phoenix, Arizona, the largest distributor of rolling papers on the planet sent me a whole box of their new ZEN (yes ZEN again) rolling mats. They are much smaller than the ones I remember and are designed to be held in the hand rather than used on the ground or table like the ones of the past. In fact it took me awhile to figure out to use the thing in the my hand using a motion very similar to hand rolling. They are already popular here in Ashland and seem to attract an audience looking for a natural and space saving solution to hand rollers. They don't (for me) work as well as hand rollers and are only somewhat better for me than hand rolling (which I do little of anyway). However one of my customers at our now closed store came in one day and using this mat, proceeded to roll me some of the nicest, thinnest, most consistent sticks I had seen, even better than most of my hand rolling machine endeavors. So, with the proper practice and thus developed skill, they are no doubt useful. And they fold up and fit in any pocket, even the back pocket of your jeans and seem to be pretty impervious to damage even when sat on. Many people who hand-roll take a great deal of pride in their artistic dexterity and it is clearly a part of their enjoyment of smoking. These mats will create a whole new crowd of magicians who will dazzle and delight their friends with their skill with this handy little tool. 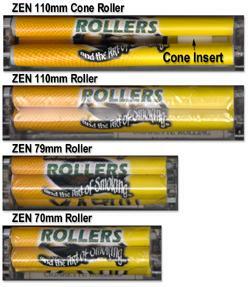 ZEN also has a host of new rollers that run the gamut from 70, 78, and 100 mm, to a Cone roller the emulates Chills Super Cone. 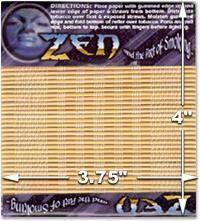 All have mildly textured blankets and great colors that are sure to attract attention, if that is your desire. We rolled our usual samples shown below with various papers and filters using the 100mm roller (which are always our favorites). The other sizes worked equally as well and the Cone version does its job as advertised. The nice thing about these rollers is that they are a bit less expensive than other brands and are well enough constructed to last for quite a while. They are all made of acrylic and all work superbly. The cigarettes you can make with any of these machines are very professional looking as you can see in the graphic at left. More importantly, the more consistent your stick is in both diameter and packing, the better you will enjoy the flavors of all of your favorite rolling tobaccos. Hand rollers, as I have said many times, are especially nice for rolling thin, non-filtered sticks of heady tobacco like Gauloises, Drum, Bali Blue, Samson, and Stokkebye's Amsterdam Shag, Chills Americana, and even Zig-Zag's Mild Golden Shag. They also create great smokes from more subtle but delicious tobaccos like Lane's Oriental Turkish or D&R's Ramback Turkish. However with the more subtle blends it is better to not pack the stick too tightly as you will have to work your sucker pretty hard to get satisfaction. Let us know what you think about rollers and especially your experience with the mats if you can find them. . We are, for the most part, injector-heads here at the magazine and would greatly appreciate any tips and experience you have had with any of the wide array of handrollers that are available. Any really unusual ones with an attached .jpg of it (please keep file sizes less than 30k) will likely be used in our next issue. If you have some real "treasures" share them with us and our readers. Contact us by clicking here or go to our Contact page for more information on how to get sample products to the magazine. Until next time - RYO - the ed.